I've been going to the Comicopia comic shop regularly since moving to Boston. I love the store and it's patrons and have even made a couple of short films with the patrons (I dub them the Comicopia Players). 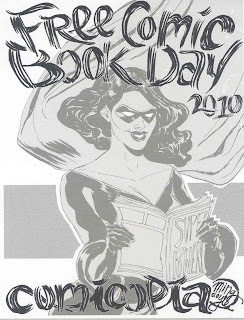 Every May 1st, the comic shops across America celebrate Free Comic Book Day. I filmed footage last year with the intentions of doing a short film. Sadly, I never got around to it. I didn't want to slack this year, as this was the first time they had comic book artists and writers doing signings. It took a while, given that I had to coordinate the soundtrack with Angela Outlaw (using songs that were played throughout the day, hence the lip-syncing), but it was worth it I think. Thanks to everyone who let me film them. Special thanks to store owner Matt Lehman, who was in the cashier trenches and didn't have time to show off. Being an event organizer myself, I sympathize with people who serve as the backbone so others can have their fun.